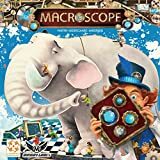 Macroscope features a funky box-shaped device covered with cardboard tokens, and this device comes loaded with two hundred double-sided cards, with each card featuring a black-and-white line drawing. On a turn, a player rolls the two dice, then removes one or two tokens from the box that match the numbers rolled. When you remove a token, you see through a hole in the box that reveals part of the topmost line drawing. 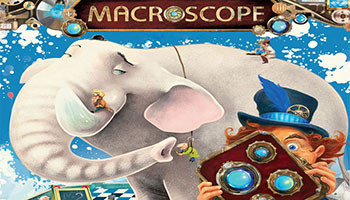 If the player wants, they can guess what the drawing represents, after which they pull the card out of the box to see whether they are correct, scoring points based on the number of tokens removed if correct and losing points otherwise. You've never seen a device like this! Peek through this curious contraption's round holes at the image hidden inside. Can you tell a rhino from a pizza just from a few swirling lines? Take a good look at the partially revealed image, guess what it could be and score points if you are right! The fewer holes you need to open in order to recognize the image, the more points you get. The most perceptive player wins the game! Roll the dice to find out which windows of the Macroscope you can open to peek at the picture inside. The fewer windows you open before guessing the picture on the card, the more points you win (if your guess is correct) or lose (if your guess is wrong).